Hundreds of years ago, bison thundering across North America acted in much the same way as wildebeest migrating across the Serengeti — nipping off grasses, depositing nitrogen in the soil, and churning up the earth with their horns. Today, such massive migrations are a thing of the past. But their absence continues to fuel one of the West’s most bitter wildlife battles. Much of the opposition is because the most commonly cited reason for reducing bison numbers — a disease called brucellosis — doesn’t hold water. Roughly half the bison in Yellowstone are carriers of brucellosis, and when they wander outside park boundaries they can transmit the disease to domestic cattle, causing cattle to abort their calves. Bison advocates argue that there’s never been a single instance of bison transmitting brucellosis to cattle, and the culls are thus misguided and cruel. But there’s another reason to reduce bison numbers that’s often missing from the public debate. Cristina Eisenberg, chief scientist with the environmental group EarthWatch Institute, is among a number of wildlife biologists who say the culls make sense. This year, Yellowstone National Park will cull roughly 1,000 bison from its 5,000-animal herd. That’s because today, Yellowstone bison don’t migrate. Not like they used to. In a human-managed landscape where bison are mostly relegated to the boundaries of Yellowstone National Park, anything above 5,000 bison is simply too many. If bison numbers continue to grow — as they would even with predation by Yellowstone’s wolves and hunting outside the park’s boundaries — the bison could decimate native grasses, damaging the native ecosystem instead of helping it. Rick Wallen, a wildlife biologist who leads Yellowstone's bison ecology and management program, agrees with Eisenberg’s assessment. He compares bison’s influence on grasslands to mowing the lawn around your house: the more you mow the grass, the faster it grows back. Some mowing can lead to a thick, healthy lawn. But if you left your lawnmower running in the same spot all summer, the grass wouldn’t survive. 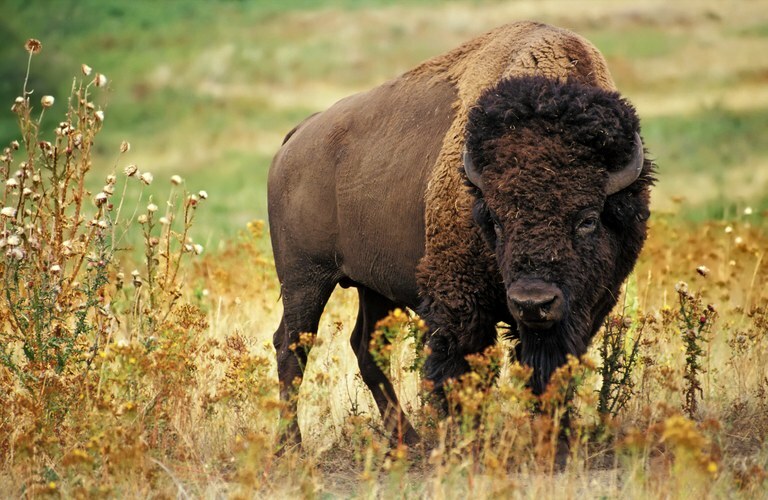 “Bison do stimulate grass production… but they need to be able to move around nomadically,” Wallen explains. Still, critics of the massive cull make some good points. Death without purpose is hard to swallow. The hunts aren’t really sporting. Most importantly, if brucellosis isn’t a real issue, why can’t bison just migrate outside the park like they once did? The answer, biologists told me, is that Montana’s landscape is already heavily influenced by people. Allowing bison populations to grow unchecked and roam at will would also mean re-establishing landscape-wide populations of wolves, allowing wildfire to burn freely, and training drivers, ranchers and municipalities to live with a new wild animal in their midst. It’s theoretically possible, but it won’t happen overnight. Still, the scales are tipping toward more land for bison. In 2011, the animals were allowed to roam on 75,000 acres near Gardiner, Montana, for the first time. Last December, Montana Gov. Steve Bullock released a plan that will allow bison to roam on 250,000 more acres outside the park. The National Park Service will also soon release a plan to quarantine bison without brucellosis, then ship the disease-free animals to bolster or establish other herds instead of going to slaughter. Little by little, tolerance seems to be growing. But none of that does any good this week. After the thousand or so bison are killed, spring calving will bring the numbers back up to roughly where they are now. And then the process will begin again. Given the current reality, the culls can’t suddenly cease without harming the whole system — as much as advocates wish they could.